The incident may have been captured on CCTV. INVESTIGATING GARDAÍ BELIEVE an officer who was the victim of an acid attack earlier this year was tracked by a person – described as a spotter – as he left his station to return home, TheJournal.ie has learned. The drugs garda, who is investigating a Lithuanian heroin gang, received facial injuries at the start of June as he returned home in the middle of the night. He was attacked on the N2 in west Dublin – near Blanchardstown. Investigating gardaí are now working on the theory that there was a spotter based outside the Dublin station who was waiting for the officer to leave. The spotter is believed to have passed on information to two people who were waiting nearby on a motorcycle. Officers believe that, due to the organised nature of the attack, they are dealing with a well-equipped criminal outfit. Gardaí are attempting to trace a motorbike which was used to carry out the attack. It is understood two people were on the bike when the pillion passenger sprayed a liquid in the car window and onto the man’s face. The vehicle then made its way back into the city centre. Officers have been tracing the route of the attack and believe that parts of the incident may have been captured on CCTV. The Garda Representative Association (GRA) is liaising with the officer affected by the incident. It is understood this officer has not returned to work since the incident due to fears for his safety. Sources have told TheJournal.ie that the man has received a number of threatening phone calls in the last few months. Despite the attack, he has not been issued with a Garda Information Message (GIM) – an official warning given by gardaí to those who are the subject of a serious threat against their personal safety. In recent weeks, the garda has also had his property damaged. Soon after the acid incident, two well-known members of the gang turned up outside his child’s school at pick-up time. 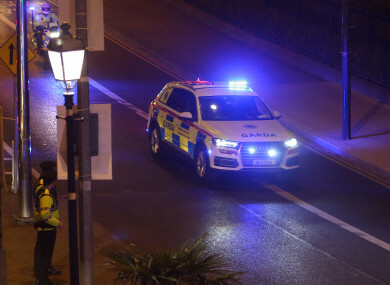 A spokesman for the Garda Press Office told TheJournal.ie: “As the incident referred to is an ongoing investigation it would be inappropriate to comment further. Email “Garda injured in acid attack was tracked as he left Dublin garda station to return home after shift”. Feedback on “Garda injured in acid attack was tracked as he left Dublin garda station to return home after shift”.